Basically, stock photos are the professional photographs taken from common places and nature. These photos obviously copyright and also come with a royalty-free if you buy it. Shutterstock is one of the best stock photos websites where professional photographers sell their work or images. Shutterstock holds over 263 million images where more than 100,000 fresh images added every 24 hours along with illustrations, vector graphics, music and footage clips. 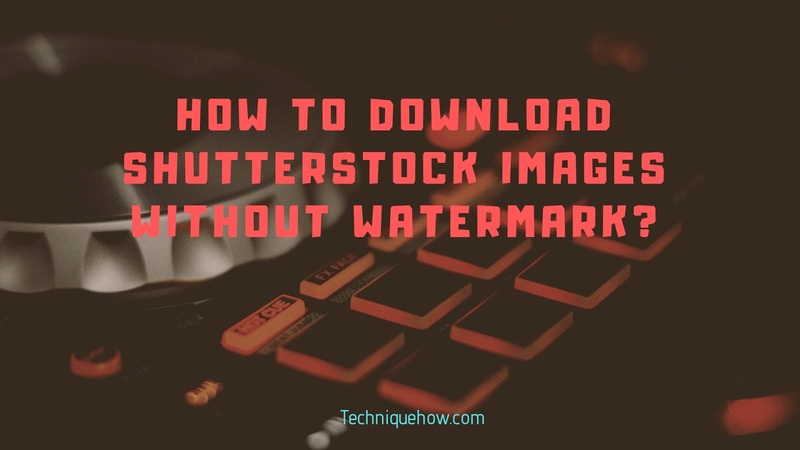 To display the work of professional photographers, Shutterstock displays the searched images there but these are having the watermark for the protection of images from downloading the original one. Might be there at least one way of downloading those images directly from Shutterstock. NOTE: This is just an educational guide. The images which are for sale, cannot be used for your work without any legal purchase. You may be sued. Well, I will suggest you some free ways to do this. But before proceeding, see the Shutterstock copyright rules. Now back to the topic on downloading free Shutterstock images without watermark. Yes, many, along with Shutterstock alternatives. How to Download Free Shutterstock Images? Shutterstock rewards its users with weekly free images who sign up on their site. That's simple. Just go to shutterstock.com and sign up there. Keep an eye to their weekly post where they publish a free image every week to download for free. i) Find the latest post on the homepage. ii) Now, scroll down below and you will find post heading like 'Free stock image of the week' by an author/account. iii) You will get the download option below it. Just sign in (if already signed up) and get it on your device. Facebook offers its advertisers with free CreativeHub mockups for business ads. There you are offered with HD images from Shutterstock. Just open the Mockup page here and select 'Single image' from the list. Now, scroll down and click on 'Select an Image' option then select 'Stock Images' option. Then, type the keywords for your target image and select any of those images. Now, you just create a sample ad for your site and give a title. Don't worry it's free till now and just a demo. Now just firstly save the ad and then click on preview 'eye' icon. This will display the demo and with that image. Now, you need to find the image address URL to download the photo only. Just download & open developer tool extension on chrome browser. This tool can reveal the actual link of that Shutterstock image on Facebook. This an amazing guide to grab the original Shutterstock images for free without any watermark. One should consider this as just an educational guide only. To do this just go to Shutterstock grabber website. Now there you have to paste the original image URL and then click on the 'Generate Link' option. After a few moments, a Download link will appear on the same page below generate link option. Just press the option and this image will be downloaded. How to get the URL of the Shutterstock image? Just open shutterstock.com and then search image there. Next, select the image and open it. Now the image will be opened and the link is on your browser's URL bar. 1. Pexels.com is the best stock photos website which is a good alternative to shutterstock.com. You can download the images from the site for free without any watermark. This site holds the CC0 license which allows users to download and use those images for their purpose. 2. StockSnap is another CC0 license holder that allows users to download watermark free stock images in full resolution. To download just go to the site and search for the desired images to take it down on your PC from the web for free. 3. Unsplash means photos for everyone, this is how they introduce their company. Unsplash offers free images which are gifted by professional photographers. It's free to download and use, not need to take permission and give credit. It's yours. Yes, this is also a CC0 license holder. Just use any of these methods and find the best one which suits your need. But, do this carefully and be cautious that you don't violate any copyright rules of Shutterstock.